Protein Blend (Whey Protein Isolate, Whey Protein Concentrate, Whey Protein Hydrolysate), Cocoa Processed with Alkali, Natural and Artificial Flavors, Salt, Xanthan Gum, Sucralose, Soy or Sunflower Lecithin, and Lactase. Protein Blend (Whey Protein Isolate, Whey Protein Concentrate, Whey Protein Hydrolysate), Cookie Fines (Enriched Flour (Wheat Flour, Niacin, Reduced Iron, Thiamin Mononitrate [vitamin b1], Riboflavin [vitamin b2], Folic Acid), Sugar, Vegetable Oil (Soybean, Palm and Palm Kernel Oil with TBHQ for freshness), Cocoa treated with Alkali, contains two percent or less of High Fructose Corn Syrup, Degerminated Yellow Corn Flour, Chocolate, Salt, Dextrose, Baking Soda, Whey, Soy Lecithin), Natural and Artificial Flavors, Xanthan Gum, Salt, Soy or Sunflower Lecithin, Sucralose, and Lactase. Protein Blend (Whey Protein Isolate, Whey Protein Concentrate, Whey Protein Hydrolysate), Natural and Artificial Flavors, Gum Blend (Cellulose Gum, Xanthan Gum, Carrageenan), Ground Cinnamon, Salt, Sucralose, Natural Caramel Color, Acesulfame Potassium, Soy and/or Sunflower Lecithin, and Lactase. Protein Blend (Whey Protein Isolate, Whey Protein Concentrate, Whey Protein Hydrolysate), Natural and Artificial Flavors, Salt, Xanthan Gum, Sucralose, Soy or Sunflower Lecithin, and Lactase. Protein Blend (Milk Protein Isolate, Whey Protein Concentrate, Whey Protein Isolate, Whey Protein Hydrolysate), Cocoa Processed With Alkali, Natural and Artificial Flavors, Salt, Xanthan Gum, Soy or Sunflower Lecithin, Sucralose, and Lactase. Protein Blend (Milk Protein Isolate, Whey Protein Concentrate, Whey Protein Isolate, Whey Protein Hydrolysate), Natural And Artificial Flavors, Cookie Fines (Enriched Flour (Wheat Flour, Niacin, Reduced Iron, Thiamin Mononitrate [Vitamin B1], Riboflavin [Vitamin B2], Folic Acid), Sugar, Vegetable Oil (Soybean, Palm and Palm Kernel Oil with TBHQ for Freshness), Cocoa Treated with Alkali, Contains Two Percent or Less of High Fructose Corn Syrup, Degerminated Yellow Corn Flour, Chocolate, Salt, Dextrose, Baking Soda, Whey, Soy Lecithin), Salt, Xanthan Gum, Soy or Sunflower Lecithin, Sucralose, and Lactase. Protein Blend (Milk Protein Isolate, Whey Protein Concentrate, Whey Protein Isolate, Whey Protein Hydrolysate), Natural and Artificial Flavors, Cocoa Processed With Alkali, Salt, Gum Blend (Cellulose Gum, Xanthan Gum, Carrageenan), Soy or Sunflower Lecithin, Sucralose, Acesulfame Potassium, and Lactase. Protein Blend (Milk Protein Isolate, Whey Protein Concentrate, Whey Protein Isolate, Whey Protein Hydrolysate), Natural and Artificial Flavors, Salt, Xanthan Gum, Soy Lecithin, Red Beet Powder (Color), Sucralose, Acesulfame Potassium, and Lactase. Protein Blend (Whey Protein Isolate, Whey Protein Concentrate, Whey Protein Hydrolysate), Natural and Artificial Flavors, Gum Blend (Cellulose Gum, Xanthan Gum, Carrageenan), Salt, Sucralose, Acesulfame Potassium, Soy and/or Sunflower Lecithin, and Lactase. Protein Blend (Whey Protein Isolate, Whey Protein Concentrate, Whey Protein Hydrolysate), Natural and Artificial Flavors, Gum Blend (Cellulose Gum, Xanthan Gum, Carrageenan), Cinnamon, Salt, Sucralose, Natural Caramel Color, Acesulfame Potassium, Soy and/or Sunflower Lecithin, and Lactase. 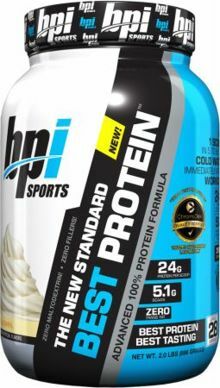 Oct 09, 2014 BPI Best Protein Now Out – Isolate First Whey Protein! Chocolate Brownie This is a Buy 1 Get 1 FREE offer! S'Mores This is a Buy 1 Get 1 FREE offer!